I walked into the National Aquarium in Baltimore, Maryland and instantly turned into my 8-year-old self; all giddy inside, I rounded the corner in anticipation of my first animal sighting. And there she was: Calypso. A 450-pound green sea turtle. Rescued off the coast of Long Island in 2000, Calypso was cold-stunned and her left, front flipper was severely infected. Because of the infection, the Aquarium’s Marine Animal Rescue Program (MARP) determined that her flipper would have to be amputated to save her life. At first, I didn’t notice that Calypso only had three fins, as it didn’t stop her playful demeanor. She swam amongst the sting rays and zebra sharks, cruising around—almost like she was saying hello to all the aquarium guests. Through Calypso, I saw how the work of the National Aquarium and the National Wildlife Federation (NWF) can come together to protect and restore the wildlife and habitats of the Chesapeake Bay. In November 2011, the National Aquarium in Maryland became NWF’s newest affiliate (an affiliate is a voluntary relationship between independent statewide organizations which support the purposes and objectives of NWF). The partnership will link conservation efforts from Appalachia, to the Chesapeake Bay, and the Atlantic Ocean. Specifically, the Chesapeake Bay is home to hundreds of native plants and wildlife, as well as important wetlands that support migrating birds and other species. In 1999, the National Aquarium realized it needed to strengthen the connection between the natural world and its visitors. “Our conservation program [at the National Aquarium] helps make that wildlife connection not only in our building, but out in the region through large scale projects and community involvement,” said Laura Bankey, Director of Conservation at the National Aquarium. Through educational tools, inside and out of the classroom, the National Aquarium brings schools and communities together to learn about the Chesapeake Bay. At the Aquarium itself, visitors can instantly learn about Maryland and the Bay area. The outside landscape has Bay themed plants and natural habitats, including native plants found on the Chesapeake coast like ferns, trees and grass-like plants. Inside, the second floor of the Aquarium features four Maryland exhibits that demonstrate how water unites different parts of the natural world; from the mountains to the sea. Out in the “field,” locals and volunteers have learned the importance of the Bay—for animals and humans alike. In fact, I learned that channels in the region are dredged for boats, and the materials –traditionally dumped into the ocean—are used to recreate wetlands, such as areas in Blackwater and Eastern Neck National Wildlife Refuge. In more than 12 years, the National Aquarium’s conservation efforts have resulted in 155 more acres of wetlands in the Chesapeake Bay. Each acre has 18,000 plants that were planted by hand for a total of 1.4 million plants. “It’s about being able to connect local citizens and students to the areas that they are most likely to care about,” said Bankey. As I weaved through the Aquarium taking in the jellyfish, dolphins, snakes, frogs and endless amounts of exotic fish, I couldn’t help but overhear a group of student’s chatter about finishing the scavenger hunt first –one kid whispered to her competitor that she wouldn’t give away any of her answers. For students, the National Aquarium provides opportunities to learn about the species and habitats that exist right in their own backyards. From September to February each year, Maryland students (Pre-K-12) can visit the aquarium for free. Outreach education with the Aquarium includes terrapins in the classroom, planting native plants, maintaining fish and plant ponds, and a variety of classroom presentations such as marine mammals and squid dissection lab. 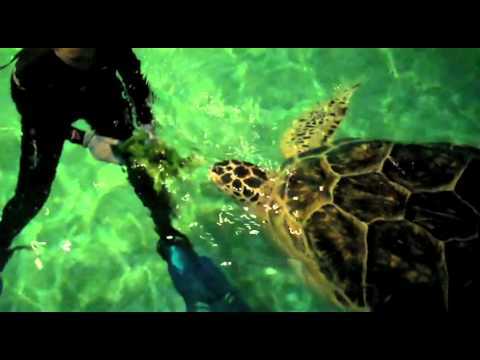 At 2:30 p.m., volunteer divers feed Calypso her daily diet: romaine lettuce and Brussels sprouts. For Breakfast, she ate green peppers. As I watched Calypso bob her head for the Brussels sprouts, I learned that turtles traditionally don’t use their back fins for swimming (they serve mostly as rotors for navigation), but to help compensate for only have three fins, Calypso uses all three fins equally. It’s through animal “ambassadors” like Calypso and the National Aquarium’s conservation efforts that students—and adults—are learning how education and volunteering goes a long way in protecting species, wetlands and habitats in the Chesapeake Bay region. This new “wildlife-friendly” friendship has created a united front on behalf of every single creature that calls the Bay region home. And though Calypso is only one example of an animal ambassador in the National Aquarium, she will always be the 450-pound green sea turtle that opened my eyes to what can be achieved when two organizations work toward the same goal of protecting the Chesapeake Bay.